PDF Number Pro is a professional app that lets you batch add Page Number to Acrobat PDF documents. PDF Number Pro is a PDF Comment & Markup Tools which can Add Stamp Comment to a PDF. With PDF Number Pro, you can Creating a custom dynamic stamp to your PDF, you can customize your page numbers anywhere on the page, specify the style of page numbers, define the font name, size, color etc. Special features include setting prefix and suffix for page number, setting page range for processing, defining start and stop page counts for page groups, labeling, and stamping custom text, alignment, custom position, opacity, rotation, symmetry page etc. PDF Number Pro is indispensable PDF watermarking software for any offices, lawyers, legal professionals etc that handles any volume of bates stamping in PDF documents. PDF Number Pro offers bate numbering on multiple PDF files at a time. Save time and make your PDF bates stamping work perfectly by using PDF Number Pro. PDF Number Pro enables you to add text, page numbers, prefix, suffix etc. PDF Number Pro support add number with symetry page mode. PDF Number Pro support bate numbering multiple PDF files with continuous numbering method. Tell app what information you want on the page. 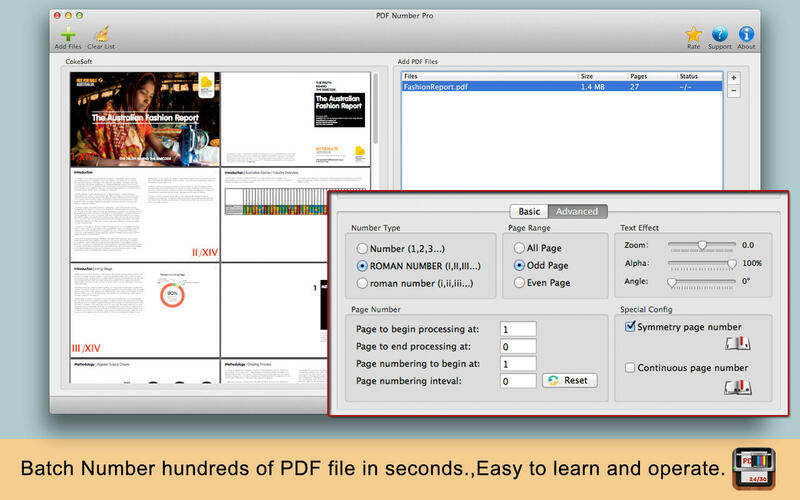 PDF Number Pro allows you perform batch PDF Stamping at a time. Labels PDF: support define label prefix. Supports "Drag and Drop" to add PDF files. Batch Number hundreds of PDF file in seconds.